Life at Washington School is rich in diversity and spirit. Students are encouraged to join clubs and participate in activities where their talents can best be used and where their own horizons can be broadened. Yet, students at Washington School are inspired to step a little outside their comfort zone; here, you will see a senior football player performing on stage in a musical presented by our drama department. For our book lovers, we offer the Page Eaters book club; for dancers we have our lovely General Gems, the drill team. Key Club members focus on ever-important community service, and our outstanding Student Council also actively embraces the value of community service while teaching leadership skills. Students Against Destructive Decisions (SADD) promotes character and integrity, while the Comics and Anime Club offers opportunities for budding artists and cartoonists. Through all of these unique opportunities, Washington School truly offers something for everyone. Art classes are available at every grade level. Students are able to experiment with a wide variety of artistic mediums. Art instructors teach technical skills while encouraging creativity. Click on the link to view the 1st edition of the WS Art Club’s newsletter, CREATE! The elementary classes, in particular, strive to improve student academic achievement through the integration of the arts into the basic curriculum. Students are frequent visitors at the local art gallery. There are three well-equipped art studios on the campus; students have the unique opportunity to utilize a quality etching press, and have access to a superior ceramics studio, complete with a kiln and several pottery wheels. A biennial art exhibit is held at Washington School, which is a celebration of the creative spirit among students, alumni and friends of the school. Each year, students are encouraged to participate in local and state art contests and are often recognized for their superior talent. The Washington School Theatre Arts Department offers every student the opportunity to participate in one of the many aspects of student theatre, including acting, directing, set design and construction, lighting, sound, and publicity. The season generally consists of one production open to the entire high school student body, a middle school production open to students in grades 6-8, and a musical produced in the spring by the senior class. Excellent facilities and talented, dedicated faculty sponsors have made the drama program a favorite with students. Elementary students have the opportunity to perform on the stage, and each grade presents a musical production during the year. The fifth graders look forward to performing in the annual Christmas program. Realizing the aesthetic value of music, Washington School offers a wide range of music opportunities in grades PK through twelve. 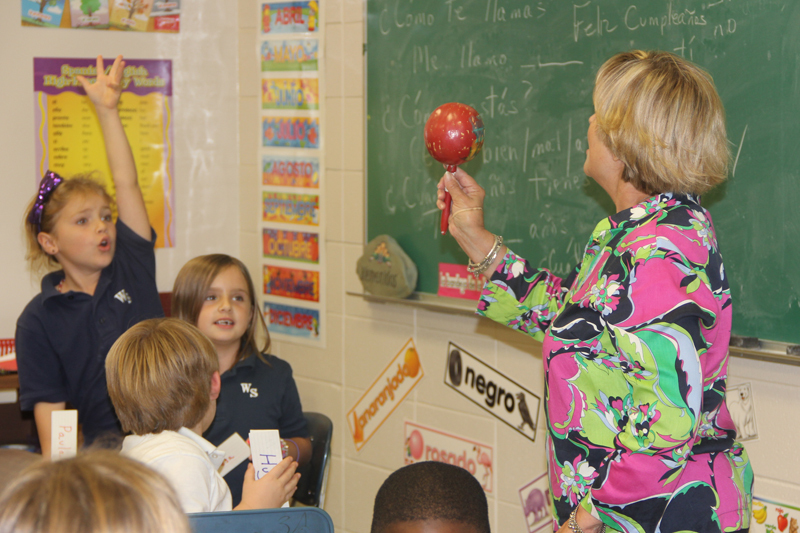 The elementary program (grades PK-5) stresses melody, rhythm, movement, and speech. The program seeks to develop musical potential in each child. The students have several performance opportunities throughout the year. In 2007, the music department added a music lab that provides keyboard instruction for every student. Through the band program, sixth grade students are given the opportunity to work on fundamentals with an emphasis on more technically demanding material. The varsity band encompasses several musical organizations open to any student in grades 7 through 12. Students may participate in the Concert Band and Pep Band. Opportunities for varsity musicians include solo and ensemble state band clinics, state band contests, Lions’ Band, honor band, Christmas and spring concerts, and student assembly concerts. Emphasis in varsity band is on music theory, history, and appreciation for all aspects of music.